Body length: Adult--1/4" to 8"
Identification: These close relatives of insects have thirty legs or more (one per body segment) and range in color from reddish brown to white. House centipedes have extremely long legs extending out all around the body. Biology and life cycle: Incomplete metamorphosis. Eggs are laid in the soil; the resulting nymphs are similar to the adults but shorter and with fewer segments. Habitat: Live in moist, protected places, especially around decaying organic matter--under logs, stones, leaves, bark, and in compost piles, buildings, and basements. Feeding habits: Feed on small insects, including roaches, clothes moths, and house flies, and sometimes plant roots. House centipedes are predaceous; garden centipedes eat plant roots. Organic control: None needed. They are actually beneficial. If they become a nuisance indoors, vacuum them up. Economic importance: They have a bite about as powerful as a bee sting, but a bite is rare. They feed on slugs, grubs, worms, cockroaches, ants, and flies, and are considered beneficial around the house. 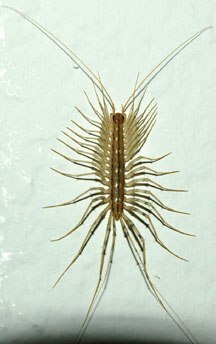 Insight: The long-legged house centipedes move very rapidly. The large, brightly colored centipedes grow to 8 inches or longer and can inflict a painful bite. We have found them floating in water puddles after rains on top of Enchanted Rock near Fredericksburg. Millipedes look similar but have two legs per segment and do not have a dangerous bite.